Dimensions: 26" x 22.4" x 28.4"
The Larson Electronics SPLT-V2-1.06K-LM30-2X150LTL-AT.DNS-BCC-TLR14-MOD1 solar powered LED light tower provides a safe and effective way for operators to quickly deploy 500 watts of intense LED illumination to elevations up to thirty feet. This solar light plant features a telescoping light tower that folds over for easy transportation, a rotating boom that allows for 360° of rotation, and a removable mast head for storing the two LED light fixtures when not in use. 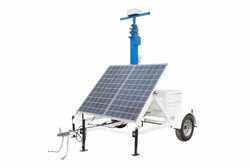 This unit features four, 265-watt solar panels and a 1,050aH capacity battery bank. The entire assembly is mounted onto a 7` single-axle aluminum trailer, which measures 14` in length, allowing operators to transport this solar light tower from location to location. 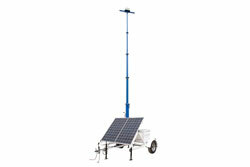 Solar Powered Light Tower: This solar light tower includes four solar panels, solar charging system, battery bank, rapid battery charger, weatherproof NEMA 3R job box, and manual crank up mast mounted on trailer with outriggers. This 1.06 KW solar generator system replenishes (6) 175aH lithium-ion batteries for 1050 amp hours of usable battery capacity per day, assuming 5.5 hours of peak charging sunlight. This system delivers 120 volts for an LED lighting system consisting of two, LED fixtures mounted atop the 30` telescoping light mast. This system will operate for 3 days without sun when the lights are running for 6 hours or less per day. 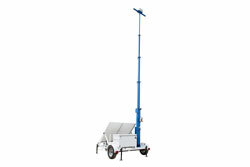 Light Mast: This telescoping three stage aluminum light mast from Larson Electronics’ is designed to allow operators to quickly and safely deploy two LED light heads in locations where this equipment must be elevated to heights up to 30` for effective coverage. 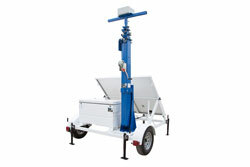 This light boom can be extended to 30` above the trailer floor for maximum area coverage, and collapsed to 13.5` for applications where a footprint smaller is required. The tower is constructed of square aluminum tubing with a base section 6.6` in length and 6" by 6" by 3/16" thick, lower section 6.78` in length and 5" by 5" by 3/16" thick, middle section 6.93` in length and 4" by 4" by 1/8" thick, upper section 7.08` in length and 3" by 3" by 1/8" thick, and top section 7.58` in length and 2" by 2" by 1/8" thick. Each section has a 1`+ overlap. 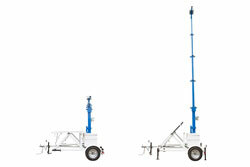 The mast is extended to its full height using an included 1,000lb rated hand winch with 3/16" galvanized steel cable. LED Light Fixtures: This solar light plant is equipped with two of Larson Electronics` GAU-LTL-150W-LED high output LED light fixtures. The LED lamps produce a total of 40,500 lumens of high intensity light while drawing only 300 watts at 2.50 amps from a 120 volt electrical system. Sixteen CREE® high output LEDs producing 1,350 lumens each are arranged in rows and paired with PMMA high purity optics to produce a well focused 24° wide spot beam that is ideal for providing far reaching concentrated illumination while still covering a substantial amount of area. We also offer optional optics with 10° spot, 38° narrow flood, 60° flood, and 90° wide flood beam spreads. The spot beams are tightly focused and are designed for high elevation mounting to achieve distance, making spot versions ideal for high mast and spots lighting. The flood beams are designed to provide more light over a larger area nearer the fixture, making flood versions ideal for use as dedicated work and area lights. The LED lamp assembly is protected by a shatterproof polycarbonate lens. As well as unparalleled heat control, the GAU-LTL-150W-LED series of LED lights from Larson Electronics also offer IP67 rated construction that is designed to withstand extremes of environmental and operating conditions. These units can withstand rapid temperature changes of -40° Celsius to +80° Celsius, are waterproof, and resist ingress of dust, dirt and humidity. The housings are formed from die cast aluminum and the optics are high transmission PMMA with 98% light transmittance. The CREE® LEDs help these units achieve resistance to vibrations and are rated at 70% lumen maintenance after 80,000 hours of use. We recommend these LED lights for use in applications where a lot of vibration, dust, dirt, dampness and abusive working conditions are encountered. Each LED unit is equipped with a back mount trunnion style mounting bracket that allows the light to be adjusted through 160° of vertical movement. To adjust the LED lamps, the user simply loosens the set screws located on either side of the unit, moves it into the desired position, then re-tightens the screws. Lamp Control: The LED lamps feature three settings for versatile operation, which is facilitated by a 3-way switch (automatic, timed interval and manual). Automatic operation is facilitated by a day/night (dusk to dawn) sensor, only turning the fixtures on when ambient light levels reach below 5 lux. Timed interval operation allows operators to set a timed schedule for the lamps. Manual operation includes standard on/off switch for manual override. Solar Panel Assembly: This unit is comprised of four 265-watt solar panels, generating a total maximum output of 1.06 KW. 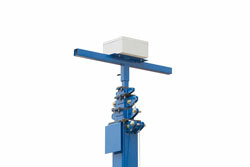 The panels are mounted to a stationary assembly. The panels are wired to the solar charger control box which manages the charging system. The four solar panels are mounted to a frame angled at 45° to capture the intensity of the sun for optimized light intake. A 20-amp, 120V 60 Hz rapid battery charger can be used to charge the batteries. For reaching power sources during charging, the system comes with a 50-foot power cord. Circuit breakers protect the charger controller and batteries from overcharging. Component Control Center: All the electrical components are encapsulated in a NEMA 3R job box that is bolted to the trailer. The weatherproof enclosure features two lockable locations at both sides, which deters tampering. Since most of these components are not rated for high heat, our component cooling system circulates air within the job box at 1400 CFM when the ambient temperature exceeds 90 degrees Fahrenheit. 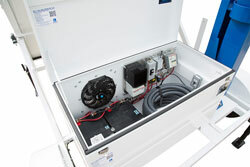 The job box that contains the component control system includes locks for security purposes. 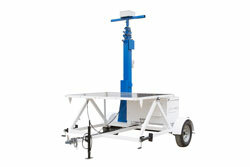 Trailer Assembly: The entire assembly is mounted to a 7.5` by 7`, single-axle aluminum trailer via six 1/2" anchor bolts. The two-wheel trailer measures 14` in length and is equipped with 3,500 lbs axle and leaf springs with run-flat 15" trailer tires. For seamless transportation, the trailer features 4-corner D-rings (suitable for crane lifting and securing the unit) and forklift skid pockets (suitable for heavy-duty lifting machines). 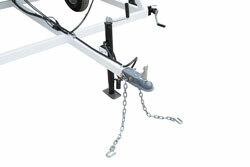 Two standard safety chains, and 7-pin flat trailer plug allow for easy hookup and towing. Hitch options include: 3" pintle hitch or 2" ball hitch. The trailer tongue can be removed for long term deployment. A rugged and waterproof job box is included, safely secured to the trailer. Four outriggers mounted to the corners of the trailer allow operators to level the trailer, and provide stabilization during deployment. All trailer lighting complies with DOT/FMVSS regulations. Applications: Remote locations, outdoor illumination, temporary work sites, construction, security checkpoints, agricultural sites, emergency camps, military, concerts, stadiums and more.